In the concluding chapter of my book Unnatural Acts, I suggest that a good way to enhance critical thinking would be to set a goal of studying various biases, fallacies, and illusions that plague human thinking. I list 59 items worth investigating. I hope this blog will help those choosing to study the 59 items, plus a few more. After this initial post, the blog will focus on specific cognitive biases, illusions, or fallacies. The next post, for example, will be on ad hoc hypotheses. But I thought I would introduce the blog with a case study that would exemplify the dangers of following intuition and instinct when making judgments. I view Unnatural Acts as an antidote to Malcolm Gladwell's Blink: The Power of Thinking Without Thinking. In Blink, Gladwell argues that intuition or quick judgments can be just as valuable as well thought out and time-consuming evaluations of data. In Unnatural Acts, I try to make the case that while intuition works well enough in many cases, for most important matters there is a much better chance of making a fair and accurate judgment by doing the hard work of collecting, analyzing, and evaluating data in an impersonal, reflective, dispassionate way. Our natural instincts work well enough most of the time, but occasionally we would be better off engaging in some unnatural acts. This is a story about a mother trying to understand why her firstborn suffered from a neurological disorder and after a short and miserable existence died soon after his first birthday. It is the story of how a powerful emotional experience affected her judgment to the point where she became unable to see anything good in medicine or anything bad in the anti-vaccination movement. I can't say I have all the details right, but the general picture is clear enough from what information is available about the case. 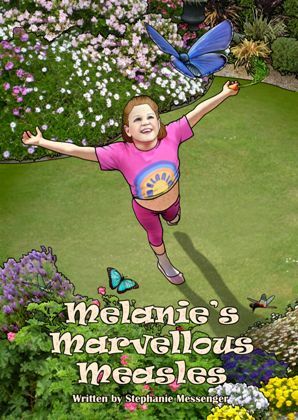 Stephanie Messenger says she wrote the children's book Melanie's Marvelous Measles because vaccinations are ineffective, children should be taught to embrace childhood disease, and getting a disease like measles helps build the immune system naturally. Messenger explains her reasoning on her website Nature Matters!, which she runs out of Queensland, Australia. Within moments of my son receiving his immunisations he was screaming. This continued for most of the day and when he wasn't screaming he was crying. This was unusual as he was a very happy, placid baby, who was already rolling over at 8 weeks and gooing and gahing at the first sight of his mother. The doctor told me his reactions were 'normal' and he'd be OK in a couple of days. The next day I called the doctor and told her I think the vaccines have done this and she told me 'no, it's just a coincidence' but to bring him back in, which I did. She referred me to a specialist. While waiting for the specialist appointment in a few days, my baby boy started doing strange things. He started arching his back and crying out in pain. He was as stiff as a board. His eyes would roll into the back of his head. He didn't have a temperature. He had also started shuddering but he wasn't cold. (I later learnt from the doctor these were convulsions and seizures). The vomiting continued and I was convinced to give up breastfeeding by the clinic sister. He vomited up the formula also. I was getting very scared. Messenger doesn't say why she thought the vaccines had made her infant sick. She may have been influenced by the anti-vaccination movement in Australia and elsewhere. She may have been influenced by seeing Dr. Robert S. Mendelsohn on the Phil Donahue show talking about the dangers of vaccination. In any case, her early judgment that vaccines caused her son's convulsions and other problems was not based on scientific evidence. All she knew for sure at that point was that the infant showed signs of illness shortly after his vaccinations. Whatever the trigger, her initial judgment about the cause of her son's seizures wasn't based on research she had done. The research would come later. To her credit, she was skeptical of her doctor's assurance that the connection between the vaccinations and the convulsions was coincidental. She was not afraid to challenge the medical community. She would not blindly accept what the health experts had to say about the value and safety of vaccinations. She set out to do her own research. That's an admirable trait and is to be commended. Vaccination killed him, I have no doubt. If he crawled under the sink and drank the same poisonous concoction of heavy metals, formaldehyde, foreign proteins, multiple viruses and a host of other toxins, the emergency room would have called it poisoning. Because it was injected into his body, it's called 'a coincidence'! The reference to the "poisonous concoction" is straight out of the anti-vaxxer campaign rhetoric. Each of the items Messenger lists has been a talking point in the anti-vaccination literature and each point has been addressed by scientists. She and two other members of the Australian Vaccination Network, Meryl Dorey and Susan Lindberg, published a book in 1998 called Vaccination Roulette: Experiences, risks and alternatives. In 1993, the Australian Health Care Complaints Commission issued a public warning about the Australian Vaccination Network (AVC). The AVC, the commission said, "provides information that is inaccurate and misleading." The name of the organization itself is misleading since its main purpose seems to be to provide reasons for not vaccinating children against diseases. Finding support for her belief that vaccines kill was just the beginning of Messenger's crusade. She now promotes the idea that getting diseases such as measles is a good thing for the reasons noted above, none of which have scientific evidence to support them. (Other anti-vaxxers go even further and advocate "pox parties.") Contrary to Messenger's claims, vaccinations are effective and children may die if they get a disease such as measles. Promoting diseases to build the immune systems of children "naturally" is dangerous. I had been lied to and my concerns about his immunisations were never followed up in any way. They were met with denials and due to my blind faith in the medical profession I didn't question. I have 3 healthy, totally unvaccinated children, who have never had a childhood disease. Unlike their vaccinated friends who have often succumbed to the diseases they have been vaccinated against. I kept these children fit and well using what is provided by nature – natural foods, clean water, sunshine, clean air, exercise, adequate sleep and a loving and nurturing environment. Understandably, Messenger would like to believe that her son's death could have been prevented. It is understandable that she sought someone to blame for her misfortune. Messenger, like most of us, would like to know what causes diseases. Like the rest of us, she would like to have control over preventing and curing illness. But these natural desires can lead us to the illusion of knowledge and the illusion of control. Much of what happens to us is due to blind luck, including the getting or not getting of diseases or illnesses. Her son's seizures and death may have been the consequence of something Messenger ingested while pregnant or it may have been due to a defect in the infant's genetic makeup. Believing that vaccines caused her infant's death makes for a more satisfying story than believing that such a tragedy could just happen because of some fluke of nature. That is not to say that things that Messenger promotes like clean water, clean air, exercise, and adequate sleep don't have an effect on our health. They do, but clean living won't prevent a gene from triggering a cascade of replication known as cancer. Eating natural foods won't prevent the effects of a genetic defect. Contrary to Messenger's belief, the scientific evidence strongly supports the benefits of vaccinations. And recent tragic facts go contrary to her belief that getting diseases "naturally" is a good thing. It is good that Messenger has three healthy children, but I don't think she gives enough credit to luck for their situation. Her negative feelings about vaccination have blinded her not only to the benefits of vaccination but to the benefits of scientific medicine. While her crusade is a natural one—given the interpretation she has made of her experiences—unnatural thinking about complex issues such as the safety and value of vaccines or the cause of death of an infant are preferable if fairness and accuracy are your goals. Great first post! The growing anti-vax trend is alarming, and as they are beginning to see in California, the ramifications of it are quite serious. I appreciate anyone who helps fight ignorance on this issue, so thanks! I look forward to your future posts. A sceptic has added added a few other titles to the series. I think this kind of thinking is dangerous. This article, and the Skeptic's Dictionary are simply conditioning people to stop thinking for themselves by making arguments claiming people are using "Pseudo Science" as basis for decision making, and going along with mass poisoning of the population. I see contradictions such as; in this article the writer quotes the CDC saying "vaccinations rarely cause serious side effects" meaning they DO sometimes cause serious side effects. So, why do you deny it and confirm it in the same article? There is plenty of hard science to confirm a rise in autism or autism like symptoms caused from vaccinations, mercury is poisonous to the human body, fluoride in the water is ineffective and it is an industrial pollutant, pharmaceutical companies are getting more and more people addicted to hard drugs, etc. "There is plenty of hard science to confirm a rise in autism or autism like symptoms caused from vaccinations"
There is none; look for yourself.